Like the other important, expensive New York City green spaces built in recent years — Hudson River Park and the High Line — this one is arriving piecemeal as it awaits fresh infusions of money. And like the others, this park faces an uncertain future as the recession and resistance to its source of financing — in this case, luxury apartments — threaten its ability to move forward. The struggle to pay for Brooklyn Bridge Park echoes similar problems around the country in creating urban parkland in a postindustrial age when open space must often be carved, at great cost, from derelict manufacturing zones, military installations or rail yards. Governments no longer have the fiscal or political muscle to finance the projects alone, and the involvement of private donors or commercial ventures has led to public battles. The days of grand development in the style of Frederick Law Olmsted and Robert Moses, whose parks and playgrounds were built and maintained by the government for decades, have given way to an era of private-public partnerships and pay-as-you-go. The tradeoff has provoked fights in many cities. Millennium Park in Chicago is a huge hit, but only after bruising battles as the price tag swelled to $475 million from $150 million. That money, critics said, would be better spent on public education and the poor, and there were concerns that the city was making public space corporate by taking $200 million from private donors whose names now adorn the park. In San Francisco, a fierce dispute ensued during the redevelopment of the Presidio, which started in the mid-1990s. Originally envisioned as a campus for nonprofit organizations, the park has become a more conventional entertainment zone, with restaurants, housing and a Disney museum. In New York, the Bloomberg administration’s insistence that new developments include open space has fostered a boom in parks: the city has added more than 500 acres of parkland since 2002, with thousands more to come, including large-scale projects like Governors Island and Fresh Kills. But it is unclear who is to pay for all these new parks, many of which are on waterfront sites, making them much more expensive to maintain than those inland. Hudson River Park, a city and state collaboration, is about half complete after 30 years of fractious planning and $400 million spent; most of the remainder is due to open later this year. The park gets about half of its operating money from a parking garage on Pier 40, said Connie Fishman, president of the park’s trust. The income is “enough for now,” she said, but will not be for the long term, especially since the pier is in need of repair. There is potential for income at Pier 57 from creating a cultural hub and marketplace, but one elaborate plan fell through and a new proposal is still in negotiations. “While the idea is that the park would generate funds to sustain itself, they put so many restrictions on what could be done in the park that it just doesn’t work,” said Douglas Durst, a real estate developer whose $330 million proposal for the pier was rejected in favor of a less expensive plan from Youngwoo & Associates. 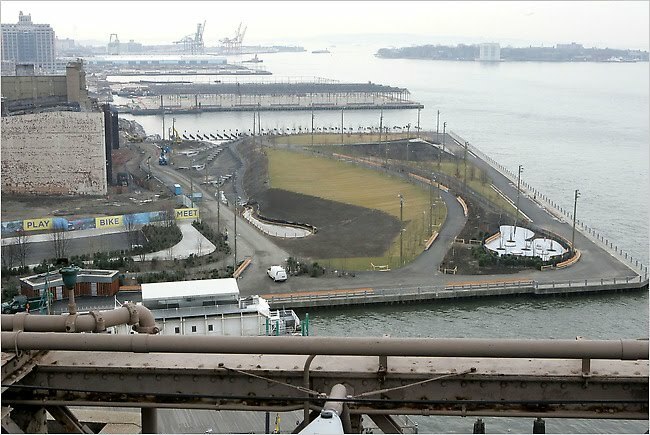 Brooklyn Bridge Park is using city and state money for construction, but officials plan to cover operations and maintenance with revenue from concessions and, more controversially, fees from housing developments built at its edges. A luxury complex, One Brooklyn Bridge Park, has been open since 2007, but some of its 441 condominiums remain empty, despite price cuts and rentals. Construction has not begun on a hotel and three other proposed housing developments near the park, with nearly 800 additional apartments. City officials say they are open to other ideas for financing operation and maintenance — which is especially expensive because the 12,000 pilings supporting the piers are under constant attack from marine borers like shipworms and gribbles. But they say they have not seen any strategy with as much promise as housing. Community activists and elected officials who fear that developers could turn what should be a public amenity into a private backyard for wealthy homeowners have accelerated efforts to block more housing. Daniel L. Squadron, a first-term Democratic state senator who represents the area, has suggested that the city instead dedicate to the park any increased tax revenues from rezoned properties within four-tenths of a mile. Worried that Albany’s fiscal woes could stymie progress, city officials have stepped up efforts to take over the project, now overseen by the Empire State Development Corporation. The city would pay $55 million, allowing work to begin on Piers 2 and 3, including installing a covering to permit winter recreation. But it is unclear whether the governor and the Legislature will give up their signatures on an amenity that could prove popular with the public. 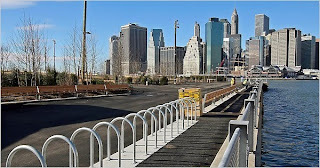 Meanwhile, the park is coming into view, with benches and tree-lined paths atop Pier 1 at the foot of Old Fulton Street, and a 1.6-acre playground on Pier 6 near Atlantic Avenue. Regina Myer, president of the park’s development corporation, decided to open the park in phases, building as money became available. She said she was confident the real estate market would rebound and support the rest. “We know that these sites will have incredible inherent value,” she said.